Which is the “Numero Uno” cause for acute stent thrombosis in real world cath labs ? It is estimated at-least 4 out of 10 stents we implant is sub-optimally deployed .Only a fraction of them go for complication .Coronary endothelium silently tolerates our aggression . How to prevent this ? A good quality anti-platelet regimen. A new mechanism for DES induced endothelial damage ! Radiation injury to coronary artery is rarely given a thought , in spite of prolonged fluro-scopic time during many complex angioplasties.While the cardiologists are fully protected the patient’s heart takes on the brunt of the attack. What happens to the coronary endothelium -metal interface when X -rays pass through it ? It is well known the radiation delivered to a tissue is many times amplified if a metal interface is present. Further , the metals can produce heat on exposure to radiation . This absorption and heat varies with different metals . The radiation injury to coronary endothelium could be significantly higher with DES , as the polymer in it absorbs more radiation than the bare metal stent. This could be responsible for late complications of DES. 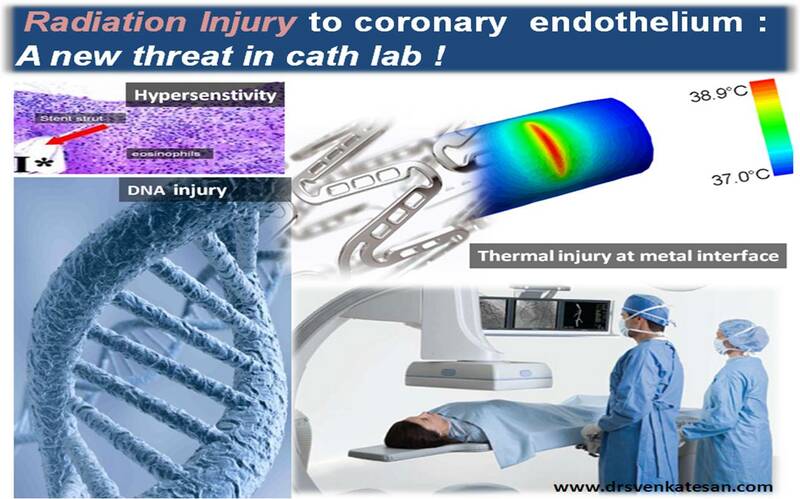 It may take many years to know the truths about radiation injury caused by of coronary stents . But always remember , unproven concepts are not synonymous with wrong concepts ! The world of medical science is moving in a alarming speed.In any field , speed is always dangerous ! That’s why we have speed breakers , traffic police , speed cameras , etc etc . The medical world is flooded with new devices, drugs , procedures . Though the mankind is benefited with many of them , a equal number could do the opposite. How to identify which is causing benefit and which doing harm ? Lay public (as well as ) the physicians are fed with half-baked ( Often quarter baked !) medical information .Many of the medical journals, guidelines , sponsored seminars , some times even text books do a clandestine campaign . 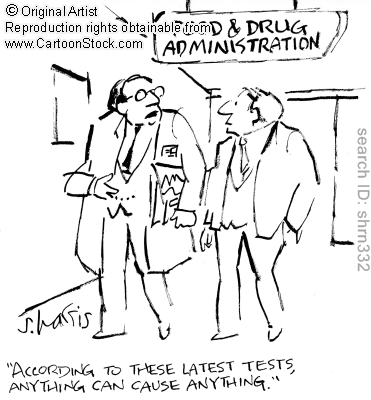 Even after a completion of major trial, real truths rarely come out . Funnily , they call them aptly , as blinded study ! Who is blinding whom is a different issue . So , in this new millennium , thousands of innovations are on the pipeline. These pipes are often infested with trivial , duplicate or even harmful concepts waiting for a grand release into human domain. In 1977 , Gruntzig mastered the opening of the obstructed coronary arteries with a simple balloon without any add ons . That patient is still alive without angina . In the next 30 years we have ridiculed (Rather , we were compelled to ridicule it ! * Read the related article Is there a role for plain balloon angioplasty ? Technology made it possible to introduce a gamut of intra coronary devices .We used (?abused ) all sort of anticancer drugs within the tender human coronary arteries .In 2002 , we claimed to have climbed the summit and conquered the restenosis with DES. And in 2010 , every one knows what is happening to DES . Who is going to regulate the menace ? Hmm . . . . then . . . Who will regulate the regulators ? Is there a way out for our patients ? or they have to suffer with it along with the disease . The later is more realistic option ! Drug eluting stents have taken the cardiology community by storm . Millions of drug eluting stents are implanted every year. Sudden stent occlusion without any warning has been the major threat of DES. Dependence of these patients , on meticulous dual anitplatelet therapy is another important caveat .This issue gets further complicated as we recognise “ clopidogrel resistance” in many of this population . This , in effect pushes these DES patients back into higher risk category. So the cardiology community cannot afford to shy away from answering the following vital questions ! How safe is DES in the long run ? Are we really convinced ? Is it acceptable to leave a DES patient’s life at the mercy of clopidogrel which has it’s own idiosyncratic behavior ? While this debate is getting hot , this new year( 2010) , there is further bad news for DES . 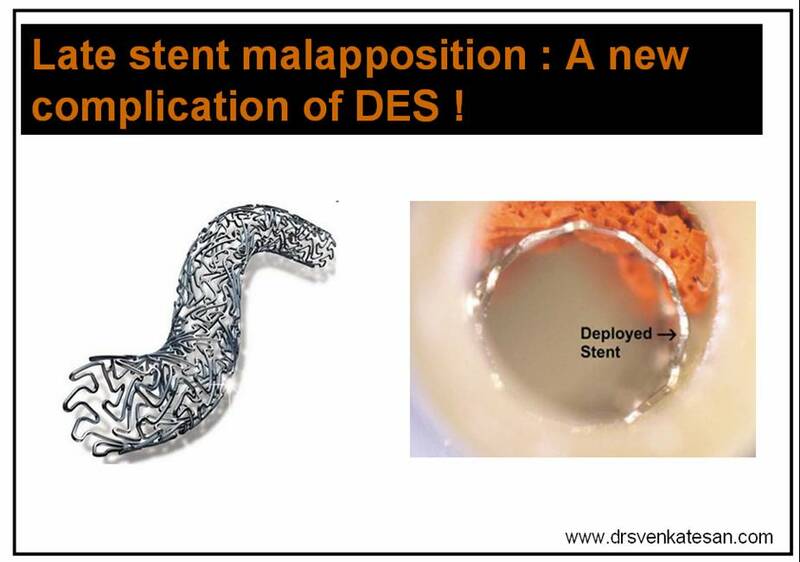 A new complication termed ” Late stent malapposition” has been found to occur more frequently in DES than in other stents ! Stent malapposition could be technical in many , but when it occurs late , it is clearly something to do with stent content or it’s behavior with the vessel wall . Some consider it as a partial late stent rejection due to late hypersensitivity reaction to the drug and the polymer . Drug eluting stents, ( Which I think , has been released prematurely into the human domain !) will face a strict scrutiny in the coming years and a turbulent time is expected. Future perfect ? All the following statements can be true in isolation ! Even , plain balloon angioplasty (POBA) can be appropriate or preferred over stents in many lesions. Bare metal stents are often better than DES . 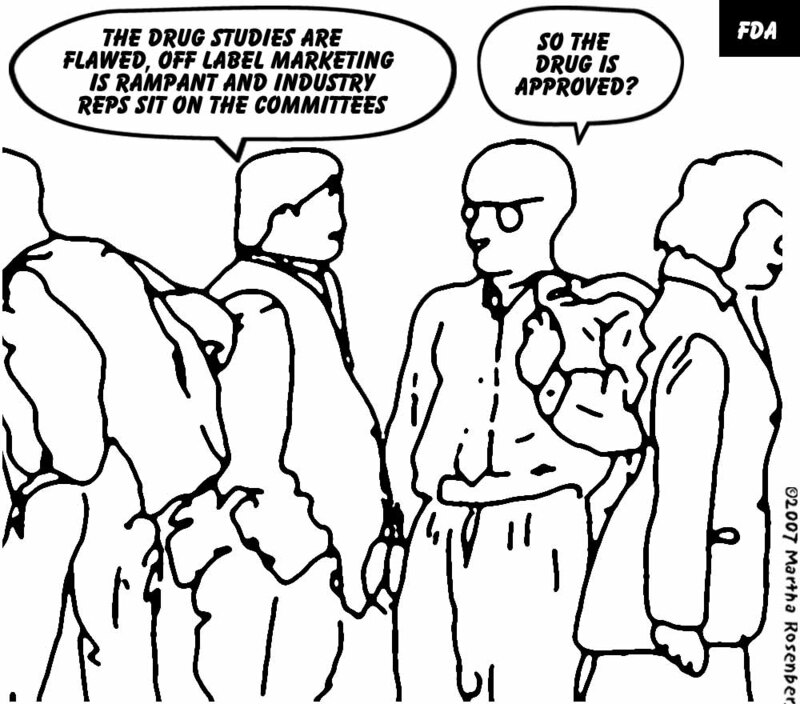 Drug eluting stents : A slap on the face of Evidence based cardiology . . . It is often said science is sacred and unfortunately we forget , science is not a heavenly creation and it is the creation of scientist of varying grades of integrity fueled by the vested interest of medical industry . 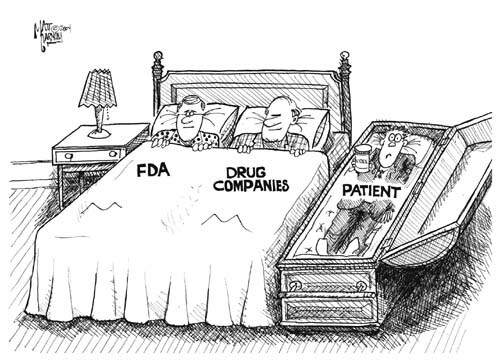 It has been a almost a daily affair , some of the devices and drugs are recalled or found to be unsafe on patients. Now the big cat has come out .The Drug eluting stent has fallen from Hero to Zero in a short span of 5 years. It was projected to have zero percent restenosis in 2002 . And now we realize it is Zero percent truth. What has started as anecdotal reports of late stent thrombosis has indeed become an epidemic in all DES patients. The five studies that has been published in the NEJM this month (March 2007) has convincingly proved how unsafe these stents are in most of the coronary population . Millions of patients in whom this stent was implanted will carry an impending stent thrombosis and possibly an SCD . Who is to take care of them ? The DES story is a clear cut case of getting premature approval for a dangerous form of treatment inside human coronary arteries. It is amazing how the scientist’s eyes are shut by the illusion of knowledge and lure of wealth. How foolish they were to think drug which was administered via the stent will selectively prevent vascularisation and leave the normal endothelium intact . Now they realized , one should not suppress the endothelial growth around the stent and got the fundamental point wrong. Which was the key reason for the astonishing episodes of late stent thrombosis. When we play with biology of nature we have to be little more careful .God has created man and his heart for over a million years . One can not alter it by a 6 month follow up study of DES . When ICDs were exposed last year , of similar disastrous outcome they were recalled and explanted . How are we going to unstent the millions of coronary arteries ? Somewhere along the line the medical professionals have lost the battle against the Wall street and NASDAQ . Or how else we can explain repetition of similar events. The wages for the modern technology , the patients have to pay a heavy price. Let us all hope common man with common sense will reign supreme over the sixth sense of the uncommon man . . .